How can I snap a window in a corner with 18.04? Super + left/right snaps windows to fit half the screen. I'd like to be able to snap four windows in all corners. CompizConfig Settings Manager doesn't seem to be an option since 18.04 uses the GNOME desktop. As you've found out, Ubuntu 18 has moved away from the Unity desktop manager which I had finally gotten used to, to Gnome desktop, which is much different. Compared to Unity, Gnome Desktop's configuration settings are all wacky. You'll need to install Gnome shell extensions. 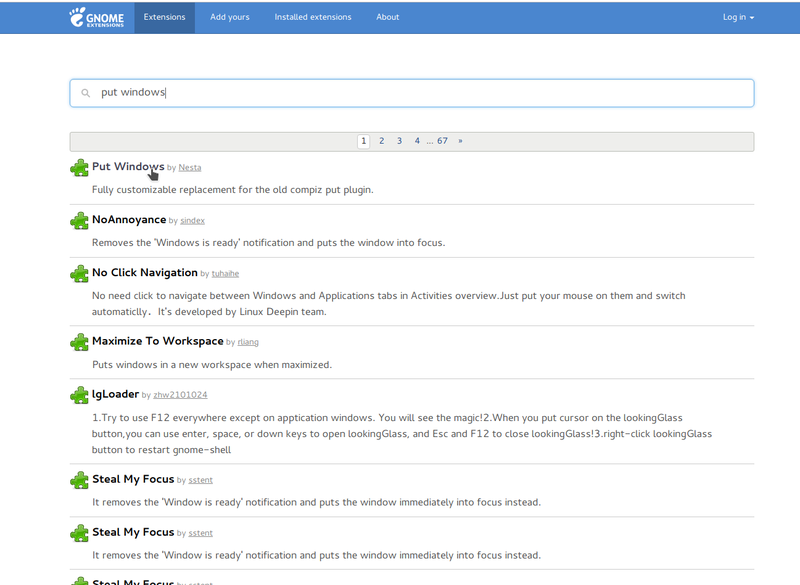 I recommend using the Put Windows GNOME extension, like @heynnema says. However, hknust likes the ShellTile one, so you can try it out too. Note that Gnome Shell extensions change how your desktop works, but you configure them through your browser, which seems kind of weird at first. Your browser is basically just a front-end messaging service to communicate with the back-end configuration settings running on your PC. In your Chrome browser, open https://extensions.gnome.org/. Search for "put windows", as shown below, and click on it. Install it by clicking the button to the far right of it. You may see a message saying you need to install "GNOME Shell integration" from the Chrome Web store. If you do, go here and install that into Chrome: https://chrome.google.com/webstore/detail/gnome-shell-integration/gphhapmejobijbbhgpjhcjognlahblep. Now you'll get that little foot-icon extension in the top-right of your Chrome: . Click it, then click the "Installed extensions" tab at the top of the page that loads. You'll now see the "Put Windows" extension installed as shown here. Note that you may need to refresh the page to get it to show the screwdriver and wrench icon once you've installed it: . Configure it by clicking the little screwdriver and wrench icon under the yellow arrow I made in the image above. Notice the default keyboard shortcuts are set like so: Super (ie: Windows key) + Keypad 7, for instance, will tile the selected window to the top-left corner of your screen. Remember, even though it seems odd at first, the browser plugins and tools are simply the front-end GUI interface to configure your computer's GNOME desktop settings. This fact alone can seem confusing at first. BUG NOTE/WEIRD BEHAVIOR: If you are trying to snap a window to a corner but its size is off, first snap it to the center (Alt + Super + S), then snap it to the corner (ex: Alt + Super + Q to move to upper-left corner), and it will now be the right size to allow 4 windows to be seen at once--one in each corner, as snapping it to the center first also gets it to be the right size--ie: exactly 1/4 of the screen area. The Put Windows GNOME extension will do what you ask. See https://extensions.gnome.org/extension/39/put-windows/. Once you switch it "ON", you can configure it at https://extensions.gnome.org/local/. Not the answer you're looking for? Browse other questions tagged window gnome-shell mutter or ask your own question. How do I enable snap window to corner in Ubuntu 18.04? Can Snap-Windows be set up for 4 windows instead of just 2? How can I add “Show desktop” to the GNOME dash or Ubuntu Dock? 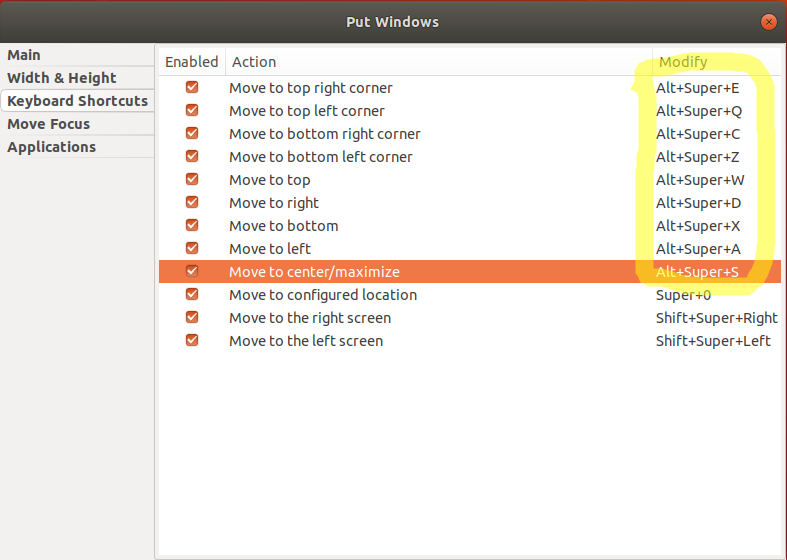 Is it possible to place windows with keyboard shortcuts in Gnome-Shell? Just upgraded to Ubuntu 18.04 and can't use compiz grid window resize commands? 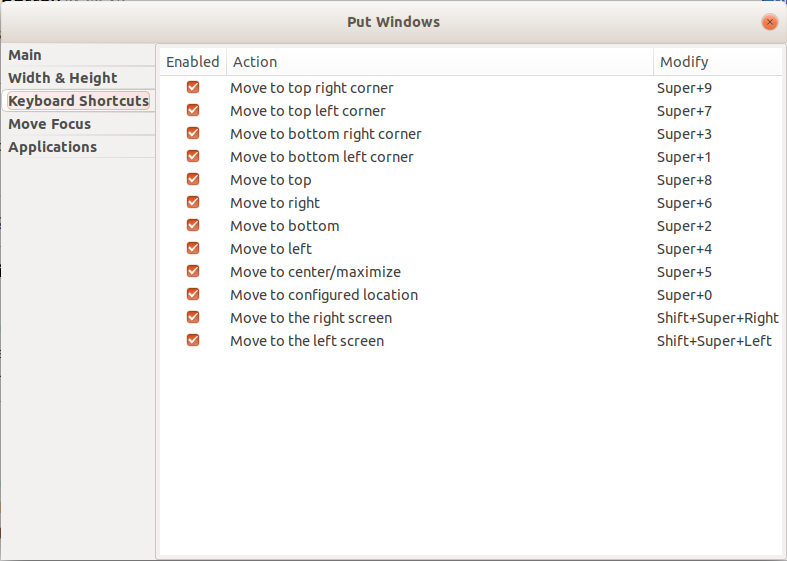 Is it possible to control window positioning using keyboard shortcuts in Ubuntu? Setup custom window snapping in Ubuntu? How do I make a second window snap to the opposite side of the screen? GNOME auto arrange 2 windows horizontally?